Robert Flacher douses his eye with the water seeping from the wall of the Merry Widow radon mine near Basin recently. Flacher visits the mine for a variety of ailments, including cataracts. BASIN - Is health, like beauty, in the eye of the beholder? If that's the case, thousands of people every year, from all over the world, find healing relief from a variety of ailments - from cataracts and emphysema to arthritis and migraine headaches - at Montana's most unusual health facilities, the radon health mines of Boulder and Basin. Those two small towns, located a few miles apart between Butte and Helena on Interstate 15, are the only places in North America where people come and pay to breathe the radioactive radon gas that occurs naturally in the mines Š for their health. The concept, even the name - "radon health mines," seems contradictory. Radon is a gaseous radioactive element that is derived from the radioactive decay of uranium, according to the U.S. Environmental Protection Agency. The Montana public health agency "doesn't encourage (the mines') use," said Dr. Todd Damrow of the Montana Department of Public Health and Human Service. "But people are free to use them." And they do, by the thousands every year. Many people make annual pilgrimages to the Merry Widow and the Earth Angel mines in Basin, and the Free Enterprise and Lone Tree mines in Boulder. Owners of the mines dismiss the EPA warnings about radon as "government propaganda." "It's not harmful at all," said Patricia Lewis, owner of the Free Enterprise Mine. Dwayne Knutzen, owner of the Merry Widow, was visiting the Basin area from Washington four years ago and found the mine and its associated campground for sale. "I was like everybody else," he said. "Radon? That can't be good for you." But the more he researched the health benefits of radon, he said, the more he was convinced of them. "The only reason I bought the place," said Knutzen, "is it's so fascinating. You hear all these bad things. But you can't ever find anybody who died from it. And there are all these benefits." Arthritis is the most common malady of people seeking relief in the radon mines, according to Knutzen. "Arthritis is the big one, but anything to do with the immune system," he said. "When you get older, your immune system starts to shut down. This (radon) stimulates those cells and gets them going again. So your body starts to heal itself. We have people come for multiple sclerosis, muscular dystrophy, asthma, even fertility if you can believe it." He estimated that a couple of thousand people visit the Merry Widow for therapy every year. "They come from everywhere - the Philippines, Europe, the U.S., Canada," he said. "A lot come every year. One guy has come every year since 1962. He's 95 now." Knutzen charges $3.50 for one-hour "treatments" in the mine. "The biggest bang for your buck is the first hour," he said. "You go in for an hour. Your blood stream will absorb the maximum amount in the first half hour. Then your skin absorbs it. Most people make three visits a day for about 10 days, usually 30 to 32 hours while they're here." Many mine guests stay in the Merry Widow's campground during their visits, or at local-area motels, he said. On their first visit, he said, many people are skeptical of the benefits of radon. "There are tons of skeptics," he said. "I've gotten lots of testimonials from them too. They're the best ones." While the owners of the mines don't guarantee any cures, legions of visitors claim that their health has greatly improved from inhaling the radon gas. The mines have received considerable national publicity in recent years, most recently in a National Geographic magazine article in January. The article has generated more interest and visits to the mines this year, according to Knutzen and other mine owners. But radon therapy is not new, the owners said. In Eastern Europe and Russia, the use of hot springs with high radon content dates back some 5,000 to 6,000 years, according to the Free Enterprise Mine Web site. And radon "clinics" and underground "galleries" are popular there today. All of the radon health mines in Basin and Boulder were once working mines dating from the 19th century. In Basin, the mines produced gold and silver. Those in Boulder also produced uranium, the source of radon in all the mines. An incident in 1950 led to the accidental discovery of the mines' purported curative powers. The story goes that a California woman suffering from arthritis accompanied her husband, a miner, to the Free Enterprise uranium mine. Following her visit, she claimed to find freedom from her continuous pain. She told a friend, who also reported relief from arthritis pain. More visitors came as word spread among chronic pain sufferers. Then Life magazine sent a reporter and photographer to investigate the claims. Their story, "Stampede of Pilgrims" to the mines of Boulder and Basin, did indeed spark a stampede of thousands of visitors to the health mines. At one time after that initial excitement in the early 1950s, there were as many as 16 radon health mines operating in Boulder and Basin, according to Free Enterprise owner Lewis. "Everybody with a hole in the ground jumped on the bandwagon," she said. "But they didn't all work. Some didn't have significant radon concentrations." A heavy door in the side of a mountain leads to the Merry Widow Mine. "Radon is a colorless, odorless gas," said Knutzen before leading a tour of his mine. "But when you come out, you register on a Geiger counter." A sign above the door reads "Fountain of Youth - Feel Young Again," a reference to the mine's radon-saturated spring water that flows from the depths of the mountain. Guests frequently brave the icy 40-degree temperature of the water with hopes of soaking away pain and swelling in joints and to improve circulation. They even splash it in their eyes to improve vision and, some say, cure cataracts. Others drink the water, hoping for relief of bladder and prostate problems, according to Knutzen. The Merry Widow mine shaft, carved smooth by miners through solid granite more than a century ago, takes guests 450 feet into the bowels of the mountain. The temperature remains constant year-round at around 55 to 60 degrees, Knutzen said. The tunnel is well-lighted, with a flat concrete floor, and just high enough for a 6-foot person to walk along, ducking only occasionally. The walls are narrow enough to touch with both arms extended. In places, the walls and ceiling of the tunnel are slick from water seeping through the granite, creating a thin sheen of slimy, greenish mud. "A lot of people take the mud off the wall and rub it on their skin for skin problems," Knutzen said. Near the lights, you can see the varied hues and sparkle of different ores and minerals in the rock. The walls are covered with names, dates and messages written by a half-century of visitors. Halfway to the end of the shaft is an alcove known as the Doggie Den. "Dogs are one of our best testimonials," said Knutzen. "People bring dogs here that can't even walk. A week later they're running all over." At the end of the passage, the tunnel is enlarged to create an elongated, grottolike room where as many as several dozen visitors can sit facing each other on padded vinyl benches along the walls. The mine's spring water collects in a shallow pool there, where guests can soak. A small bookshelf near the benches offers paperback books, magazines and board games. An alcove branching off to the side of the room contains a card table and chairs. About 20 guests visiting the Merry Widow on a June Wednesday sat on the benches chatting amiably during their hour-long treatment sessions. Some read. A few played cards. Most were couples in their 60s or 70s. None of the visitors that day were from Montana. The discussions invariably revolved around their various ailments and accounts of the mine's success in treating them and others they knew or had heard about. Lyle Long, 71, and his wife Beverly of Everett, Wash., were visiting the Merry Widow last month for the fourth time in five years. 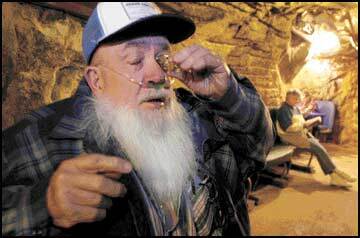 "We missed last year," said Lyle Long, who lit up a cigarette immediately upon emerging from the mine. "My wife's uncle got us started coming here. He came here for 21 or 22 years. I have arthritis. She (Beverly) has trouble breathing. It seems to help here. Oh yeah, it makes a big difference for me. I have arthritis in my hips, shoulders. I was a logger. About the third day I went in the mine I started feeling better. I started sleeping all night." Clarence Huebner of Edmonton, Alberta, had spent 28 hours in the mine so far on his first visit. "I think it's only about a nine-hour drive" from his home, he said. "I soak my eyes in the water. If I read, my eyes start watering. Now I can read for hours. I had a bad knee when I came in. I can still feel it, but now I can walk." Karen Weinstein of Mesa, Ariz., was featured in the National Geographic article about the Merry Widow in January, along with her 15-year-old Chihuahua, Mocha. She and Mocha were visiting the mine again in June for the seventh straight year. "Mocha has really bad arthritis," Weinstein said. "She just acts like a puppy now sometimes. And she had cataracts, but they cleared up. She drinks the water." Larry Sloan, 73, of Cheyenne, Wyo., said he's been coming to the mine regularly since last summer for treatment of myelodysplastic syndrome (MDS). "My bone marrow don't make red blood cells anymore," said Sloan. "This is trip number seven for me, for a week at a time. … I just feel like a different person after I've been here. It may not be curing anything. But it makes me feel better." Despite the prevalent topic of illness, the banter among the mine visitors is often lighthearted. There are frequent jokes about the powers of radon: "And our eyes only glow a little in the dark now. It's easier to find the bathroom at night." Across I-15 from the Merry Widow in Basin is the Earth Angel Mine. Similar inside to the Merry Widow, but with a more cramped, 600-foot tunnel and fewer amenities, the Earth Angel was purchased five years ago by Bill Remior. He charges $2 a day for "treatments" in his mine. A disabled World War II veteran, Remior had visited all the area's radon mines for 20-some years before buying the Earth Angel. "I seen what good they did me," he said. "I figured it was the Good Lord was doing it. I've got a weak heart and only half a lung. But I can go good yet. It's helped me. I seen a lot of miracles come out of here. And I never seen anything wrong." The opinion of many physicians, however, is altogether different. "It's hard to believe that something like radon, which we know to be a carcinogen, people will pay to go sit and inhale it," said Dr. Peggy Schlesinger, a Missoula physician specializing in arthritic conditions. But people suffering from the chronic pain of arthritis are often desperate, she said. "People are always looking for alternative treatments," Schlesinger said. "But radon is a clear, bad actor. It's a carcinogen. I don't get it." She attributes the testimonials for the radon health mines, in part, to a placebo effect. Visitors expect to feel better, she said, so they do. "There's a 30 percent placebo response to anything," Schlesinger said. "And I'm grateful for whatever works to make people feel better. … But I wish they'd take the radon out and just go to the mine." People should be aware, she added, that there have been significant, major advances in the medical treatment of arthritis in the past five years. "All in all," she said, "it is a great time to have arthritis." But to the true believers at the Merry Widow, the mine remains the answer to their problems.